I found this slide in a box full of pictures from San Francisco's Mission District that I had bought on eBay, but it clearly does not belong there... it's in a very unusual aspect ratio, taken on 35mm black and white slide film. 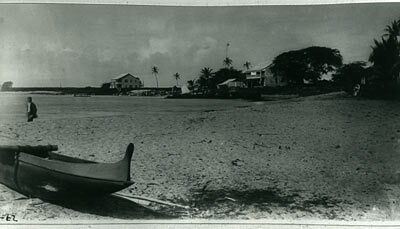 I assume it's from the 1930s or maybe even 20s and was probably taken on Hawaii. I love the spooky atmosphere of this shot. What are we looking at? The houses in the background? The canoe? The man? It's a masterful composition and I wish I had more slides from this photographer.